-Back in stock! W.T.C. Prudctions version featuring bonus tracks. -Remixed, revised and remastered version on Totenkopf Propaganda. -Acherontas once again offer intense and sinister Black Metal art at its best, highly recommended! -Unholy hymns of atmospheric Polish Black art. -Great underground Old School Death Metal from France. -Raw Pagan Black Metal from Poland, include their demo from 1996 and a rehearsal from 1995. -Cult recordings from depth of Finnish black metal underground, include the debut demo and an unheard rehearsal tape. -True hateful Black Metal from the depths of horned Podlachian shadows. -Debut album of the french newcomers, their music can be mostly compared to Peste Noire or Akitsa without loosing this own identity. -Nine years after their second album "Gold oder Blut", this infamous horde from Thuringia strikes back with a vengeance, highly recommended! -Only a few copies in stock, act fast. -The Aura is simultaneously chaos harnessed, and chaos unleashed: bask in its glow. Highly recommended! -Old School Black Metal in the BlazeBirth Hall vein from Moscow and the United States of America. -Hellenic Cult Black Metal in the vein of old Rotting Christ and Thou art Lord. -Greek heretic Black Metal of death. -Bizarre and chaotic Death Metal, completely original in intent and execution drawing influences from Finnish Death Metal and the Cthulhu Mythos... Highly recommended! -Flawless, grim, raw, astonishing Black Metal from Finland. -Old School Horror Heavy Metal cult featuring member of Incriminated. -Pro-cassette version of the band's second album with different cover and layout, blackened hateful and evil Metal. -Seven tracks of Dark Ambient depression and sin that shall fill your psyche with utter depravity. -Tracks off the first four demos, Night and the Fog Part III and unreleased material from this cult Polish horde. -Experimental ritualistic Black Metal noise from Finland. -Coming in a extra nice handmade tapebox with silver print, high quality cardboard tape inlays with silver print, an extra A5 booklet with a personal old rare photos and printed tapes! -Dirty, fast and raw Black Metal, but also with some melodic and even Doom elements. -With the howlings of mutilated corpses a viscious night of mass grave has arrived... Highly recommended! -New Goatmoon recording with alternative line-up. -Compilation of the threee demos of this obscure Polish Black/Death Metal horde, recommended! -Hateful and misanthropic Black Metal, official cassette version released under the banner of the mighty Putrid Cult. -Debut demo of necro Black Metal worship released under the banner of Werewolf Promotion. -Raw Old School vampiric Black Metal from Greece. -Oppressive, destructive, apocalyptic Death/Black Metal hell, comes with a poster. -British Heathen Hammer Black Metal. -Primitive thrashing Black/Death Metal cult from Finland! -Collects all the demos including the complete unreleased demo #3, highly recommended! -Twisting, gnarling, ethereal Black Metal violence executed with militant precision and explosive fervour. -Featuring interviews with Gehenna, Bolzer, Irkallian Oracle and Axeslaughter. -Black Metal from Germany and Russia released under the wings of Werewolf Promotion and Urgrund Division. -Icy, hate-filled Polish black metal, originally released in 1995 and now reissued with their demo as bonus. -Pagan Black Metal from ukraine with epic songs of considerable length, spiced with some folkloric elements. -Hatefull Black Metal from Greece. -Grim and cold Black Metal that pierce into the soul with the grandeur of majestic and hypnotic melodies. -Dismal, suffocating Doom of the highest order, second pressing of this great cassette. -Official rerelease of the debut Mastiphal demo recorded back in the glorious days of the Polish underground, evil mystical Metal. -A compilation containing the early versions of the band's classic raw Black Metal anthems, recommended! -Mandatory mini-album from one of the best Polish Black Metal horde. -Debut full length on Northern Heritage, highly recommended! -Features both of their EPs: "Further Down The Nest" and "Mdlosci". Highly recommended! -Misanthropic Black Metal in the traditional raw vein. -Back in stock! Their best album, a huge step forward into darknes. -3 LPs, one picture LP, an EP and a booklet all in a box. -Poisonous, dirty and hateful Black Metal with their personal touches such as melodic and classic heavy metal riffs. -Underground black metal from Poland. -Official tape version of the awesome debut album from these German Unholy Thrashers. - Pure Pagan Black Metal from these two cult Polish hordes. -A Storm of intolerance and pitiless hatred from these French disciples of Warmongering Black Metal! -Assault of elite Hellenic Black Metal presented in the most pristine yet still underground manner. -Putrid and funeral Black Metal from Finland. -Mandatory Black metal from France. -Dark Doom/Black Metal from Canada and Depressive Black Metal from United States of America. -40 minutes album consiting large variety of material from gloomy brooding heavy electronics to rusty and dark rhythmic metal percussion industrial and epic atmospheric tracks. -Debut demo of this new raw Black Metal horde from Quebec. -Three songs of low-fi, minimalistic Black Metal, ugly and violent Blackness played the old way. -Epic, yet progressive, darkened Metal. This is the reissue on Paragon Records featuring 11 minutes of bonus material. -Totally infernal, dark, obscure and possessed Black crushing Metal from Hellas's deepest underground! -Depressive Dark Ambient from the mastermind behind Picture Ann. -Pure ritualistic Black Metal, their best material to date. -Featuring all songs which were previously available solely on vinyl, tape and compilation releases, all songs have been carefully re-mastered to keep up the audio quality. -A bastardized mixture of Black/Death Metal inspired by old masters like Demoncy, Mystifier, Mayhem, early Rotting Christ, Mortuary Drape, Archgoat, Varathron and Profanatica. -Raw Black Metal with a melodic edge versus Dirty Black/Thrash, great material from Poland! -Two raw Polish Black Metal acts collaborate to spread their hatred. -Raw heathen Black Metal inspired by the BlazeBirth Hall from the United States of America. -Atmospheric Ambient/Raw Pagan Black Metal from Poland. -Split album released by Under the Sign of Garazel Productions, highly recommended! -Disturbing tornado of the most extreme elements of black, Grind, Death and Noise. A filthy recording filled of hatred, highly recommended! -Atmospheric Black Metal from the south of Poland. -True Black Metal from Finland, highly recommended! -Raw yet technical Black Metal, with Old School, Avant-garde and even some eighties Thrash Metal influences. -Debut album of Polish atmospheric Black Metal. -Dungeon Synth/ ark Ambient from Germany, recommended! -10 cult compositions taken from the rare demo and album recordings, including an unreleased live hymn during the career of this true cult band from the obscure East-Euro underground! -The first album from 1992 finally available again with two bonus tracks. -Back in stock! Featuring Akitsa, Pagan Hellfire, Christicide, Blessed in Sin, Finis Gloria Dei, Funeral Winds, Ungod and more. -Part Akitsa and part Bone Awl this ferocious two piece from Canada really crank out some top blackened punk on this one. -Polish Black Heavy Metal project featruing member of Necrostrigis and Empheris. -Epic and brooding Cascadian Black Metal from Poland, highly recommended! -Total Isolation Records and Nebelklang finally present an official re-release of Wehrhammer's furious Demo CD-R, highly recommended! -Uncompromising hostility from these long running purveryors of militant Black Metal. -Radical Black Metal from Sweden. 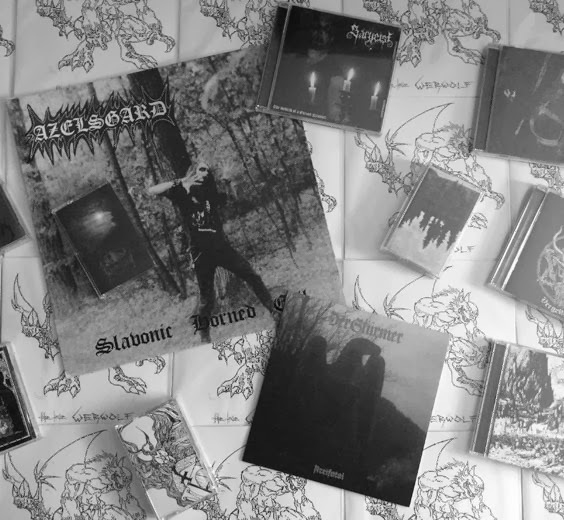 -Polish and German Black Metal elited gathered, recommended!